A popular Sahih Bukhari and Sahih Muslim hadith quotes Prophet Mohammad (PBUH) as saying that once prayer has started, Muslims are not supposed to rush to join in quickly. Instead, they must proceed to the mosque at a calm and normal pace. If they miss any part of the prayer, they should simply complete whatever they missed, rather than making a mad dash to join the rakkah. The intention of this command, clearly, is to avoid creating hassle for yourself or anyone else. 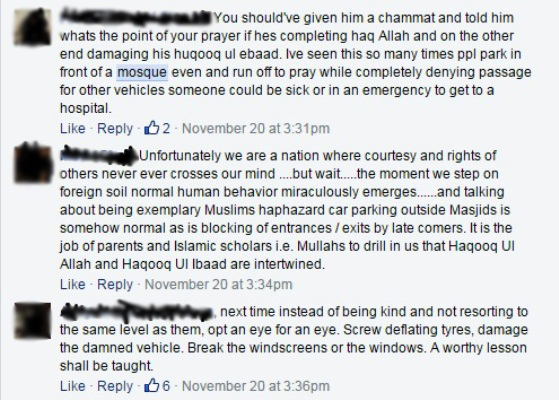 If you live anywhere near a mosque in Karachi, or have travelled to work, school, or even the hospital during prayer time, then you may know how seriously Pakistanis take this teaching. 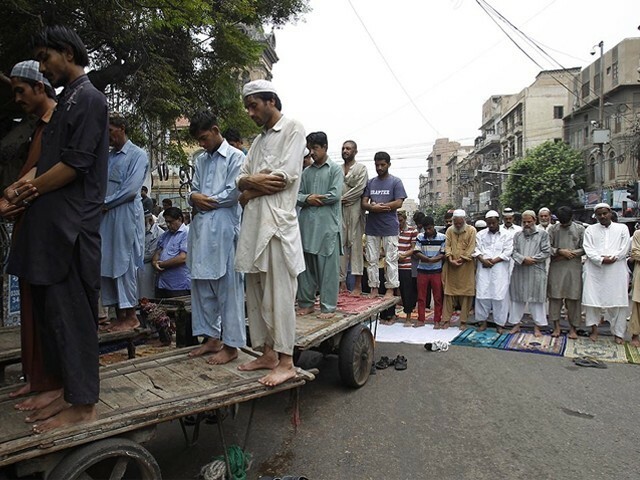 In a teeming city of over 25 million people, some inconvenience is to be expected, but it seems all courtesy is forgotten during prayer time. 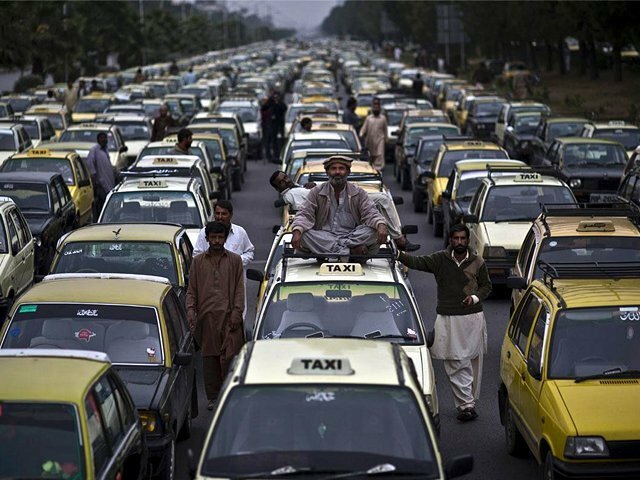 Prayer goers, who for whatever reason did not leave for the mosque on time, will consider it perfectly acceptable to rush to their place of worship in their vehicles, breaking signals and perhaps a few bones along the way. 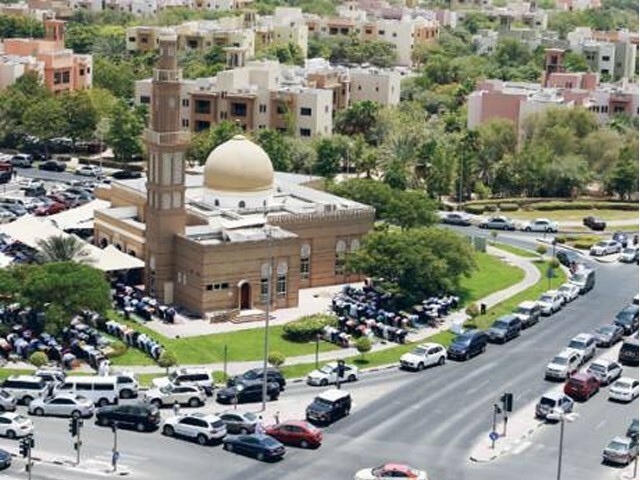 Upon arrival, they shall double park and obstruct an entire road, or shall simply block someone’s gate for 15 to 30 minutes, so that they can go inside the mosque while numerous people suffer. There are several issues with this. The first is that it goes against the teachings of the very religion they are trying to collect sawab (reward) from. While the Prophet (PBUH) didn’t mention cars specifically in the hadith – obviously because they didn’t exist at the time – the principle behind the command to slow down on the way to the mosque is self-explanatory. Also, the self-righteous folks who behave like this obviously believe that their single contribution to the prayer is worth inconveniencing others, even if the consequences are dire. Months back, I saw an ambulance with sirens wailing stuck during such a situation, and I myself was unable to attend an emergency on one occasion. But it is worse for people who live close to mosques. By some coincidence, I have twice lived in a home opposite a mosque; once in the Middle East and once in Pakistan. 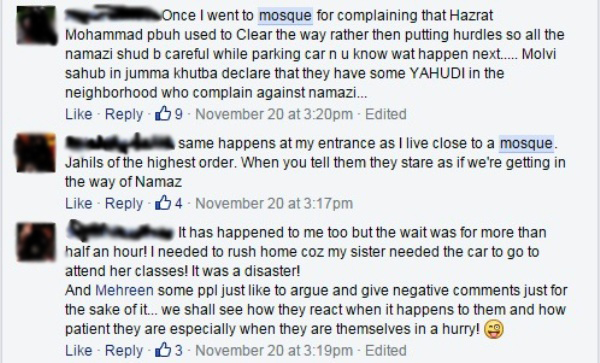 In Saudi Arabia, not once did someone obstruct our gate during 12 years of living in front of a mosque. On the other hand, in Pakistan, it was customary to find a car cutting off our entrance at least two or three times a day. To make matters worse, the offenders were never apologetic. If anything, they were arrogant in their supposed virtuosity. 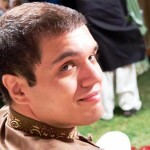 Recently, a Karachi resident shared her story on the Facebook page ‘We’ve had enough!!! 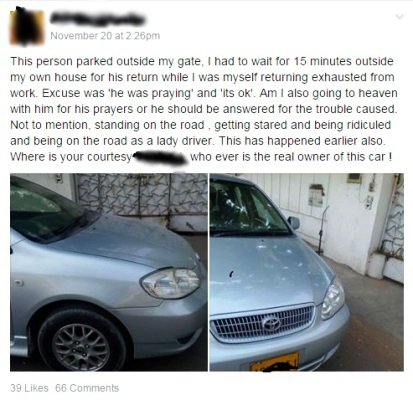 !’ when someone barricaded her gate with his car in order to go and attend prayer. 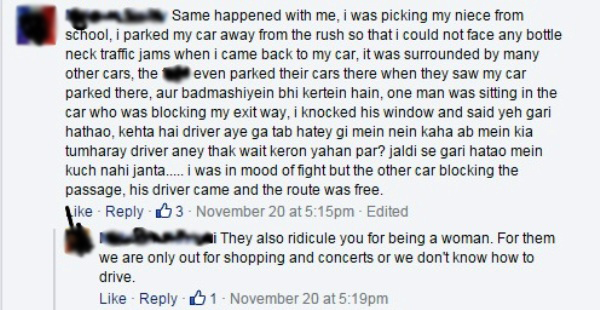 Sadly, because she was a woman, she only suffered more at the hands of other drivers who impatiently honked at her to move her car from the road while she waited, and chastised her for being a ‘lady driver’. To avoid unpleasantness, a simple solution for worshippers is to park only where there is a legal place to leave a car. By saving yourself a 15-minute walk, you aren’t doing the rest of us any favours. Please don’t inconvenience the rest of us for your convenience.